It's free (!) movie night for the next four Fridays, starting tonight at the Santa Monica Pier! Front Porch Cinema: Film Independent at the Pier is ushering in its second annual lineup of films, kicking off the four-week program with Los Wild Ones, a documentary about Los Angeles-based Wild Records. "This documentary, filled with great music and large personalities, follows (founder Rob) Kennedy and his extended family of young, talented Latino musicians as they face an uncertain future for the label they all love," according to the release. Doors open at 6 p.m., while the film begins at 7:30 p.m. There will be food, drinks and even lawn chairs for rent. There will also be live music by the Rhythm Shakers. The next three weeks are filled with fun movies as well. 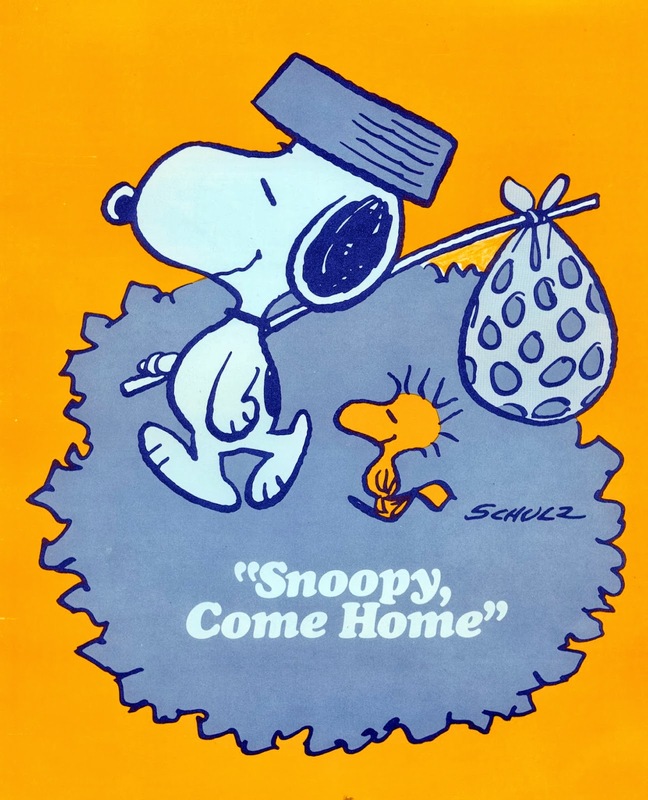 Sounds like it could be a fun date night, or check out week 3 (Oct. 11), when the program features a super-family-friendly film, Snoopy, Come Home! Oct. 4 -- The Sting (PG) -- It's the 40th anniversary screening of the film, starring Paul Newman and Robert Redford as two con men who hatch a complicated scheme to take a crooked banker for everything he's worth. The evening will also feature a ragtime pianist and card tables. Oct. 11 -- Snoopy, Come Home! (G) -- It's the pier's first "Doggie Drive-In!" Bring the whole fam to this pet-friendly night, complete with dog treats and water. Oct. 18 -- Chasing Ice (PG-13) -- An environmental documentary, in which photographer James Balog took time-lapse cameras to the Arctic to film the world's changing glaciers. You know, I was going to write my own review of the adorable animated movie Cloudy with a Chance of Meatballs 2, from Sony Pictures Animation, which opens tomorrow, Sept. 27—but I'll let my daughter and her friend Aubrey (who also happens to play Lily on ABC's Modern Family) do that for me. In case you don't know the story, it picks up where the first movie left off after inventor Flint Lockwood (voiced by Bill Hader) thought he saved the world from his food-making machine. This time, the food has taken over his island and have become a cross between food and animals, aka "foodimals." It's a cute journey about saving the world—again—with friends. Whatever your politics, I'm sure you have questions about the upcoming enactment of the Affordable Care Act, aka Obamacare. With all the jargon being thrown around, it's hard to sift through what everything actually means—and what insurance companies will soon be responsible for, once open enrollment starts Oct. 1. Anthem BlueCross wants to make the transition easier. And with women making 80% of healthcare decisions in the home, it's important for moms to be in the know and be a strong advocate for their family's health care. While there's a lot to consider financially and logistically, keep in mind that having insurance is critically important. A three-day hospital stay can cost, on average, $30,000, according to studies by health-care companies WellPoint and Kaiser. If you end up opting out of employer-provided insurance and Medicaid and want to find affordable insurance so, if anything, you don't incur the tax penalty for not having insurance (starting at 1% of income or $95 individual/$285 per family, depending on which is greater), you will be entering the exchange, or marketplace. Later this fall, Anthem will have online tools that will help families determine which health plan is right for them. There will be family checklist and a subsidy estimator tools to help navigate options and costs, respectively. the plans will come in tiered packages. At Anthem, there will be a range of packages, from Bronze— which will have the lowest monthly premium and will cover 60% of expected costs—to Platinum, which will have the highest monthly premium and will cover 90% of expected costs. CC on her first game day! 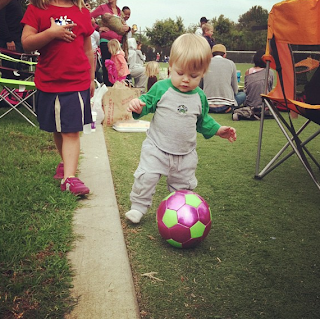 Baby Will following in his sister's footsteps. UPDATE: Congrats to Laura J, who won the Safety 1st Elite 80 3-in-1 car seat! I agree! The expiration date info is surprising and important. Please email me at losangelesstory@gmail.com with your shipping information. Thanks again to everyone who participated, and stay tuned for more giveaways! As I mentioned in my last post, tomorrow marks the last day of the very important Child Passenger Safety Week. Sponsored by the U.S. Department of Transportation and the National Highway Traffic Safety Administration, Child Passenger Safety Week was launched to inform parents and caregivers of how to properly secure kids up to 12 years old in the best car-restraint system. Just now hitting store shelves, the Elite 80 converts as your child grows, and features the Air Protect cushion system, which protects your child's head while buckled in. The seat also features GCell HX patented foam to provide high-quality body protection. In March of 2011, the American Academy of Pediatrics (AAP) updated their car seat recommendations, advising that children should remain rear facing until the age of 2, or until they reach the maximum height and weight requirements allowed by their car seat. According to a study in the Journal of Injury Prevention, children under the age of 2 are 75% less likely to die or be severely injured in the event of a car crash if they are rear facing. When a child is rear facing, their head, neck and spine are better supported and, in the event of an accident, crash forces are distributed over the child’s entire body. According to the National Highway Traffic Safety Association, 75% of car seats are installed incorrectly. 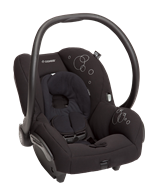 Every car and car seat has different requirements for the safest installation, so before you get started it is important to read both the car seat and car manual. Never use used or old car seats. Car seats do have an expiration date, and it is to understand the risks associated with using an expired or old car seat. The reason for an expiration date is because plastic can warp and materials can fray, which can make car seats less safe to use. Car seat technology and state and federal car seat regulations change. A car seat deemed safe more than 6 years ago may no longer meet federal testing regulations. Important warning labels may wear out, and instruction books may get lost, which can lead to improper use of the car seat. I'm giving away 1 Elite 80 3-in-1 Car Seat, courtesy of Safety 1st. To enter, leave a comment below, telling me your best safety tip—or what car safety tip listed above most resonated with you. Good luck, and I will announce the winner on Monday, Sept. 30! This week marks Child Passenger Safety Week (Sept. 15-21), and I wanted to shine the L.A. Story spotlight on children's car seats and booster seats. In California, where we live, kids are required to be in a restraint or booster seat through age 8, according to the Governors Highway Safety Assn. (That said, the American Academy of Pediatrics recommends that kids ride in booster seats until age 12 or 57" tall.) While the age varies depending on the state where you live, it's important that your child's seat is right for his/her age. We had the opportunity to check out the Maxi-Cosi Mico AP infant car seat (SRP: $199.99), which hit shelves in July. While CC moved up to a booster seat last year, Baby Will is still (although just barely size-wise) rocking the infant version. The Mico AP, which has 14 color options, is not only incredibly light -- much lighter than Will's previous car seat -- but it also offers formidable-looking Air Protect Side Impact Technology, which protects the child's head area in case of an accident. The seat is well-padded in areas surrounding the head, body and leg areas. I was impressed with how protected Will looked and felt in the Mico AP. In fact, it was such a different feeling, pulling him out of what seemed like a protective shell every time I got him out of the car seat. He is completely snug and comfy in his new seat, and while he's able to look around and move, his head and body stay comfortably in place. 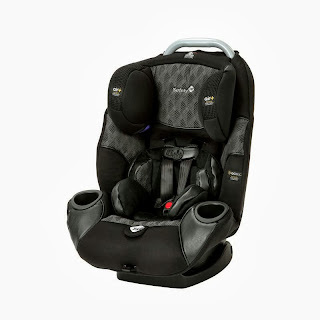 The seat also comes with a padded 5-point harness, an adjustable base, a soft head insert for extra support, and a detachable sun visor, which protects baby's face while he's in a rear (window)-facing position. Will is actually about to outgrow this seat. The Mico AP is designed for children 5-22 lbs, with a height of 29" max. Baby Will is about 20 pounds and 27". For now, though, Will is a snug little bug -- and that gives me a little more peace of mind. Check out the below infographic from Maxi-Cosi about the next step, Booster Seat Safety. 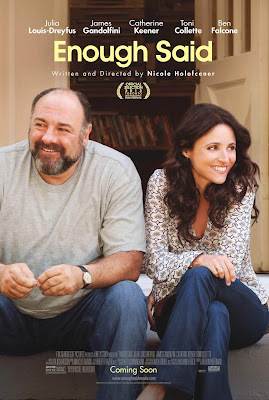 Enough Said, starring Julia Louis-Dreyfus and the late, great James Gandolfini, is about second chances. Lots of them. The romantic dramedy, from writer-director Nicole Holofcener that hits theaters Sept. 18, centers on Eva (Louis-Dreyfus), a divorced masseuse who's starting to feel the emotional pangs that come with having a daughter (Tracey Fairaway) who's about to leave for college. While out at a party with her tensely married (in a funny way) friends (Toni Collette and Ben Falcone), she meets Marianne (Catherine Keener), a poet who will become one of her clients, and Albert (Gandolfini). After an awkward introduction, a romance between Eva and Albert starts to bloom. Turns out, Albert is about to be an empty nester himself, as his own daughter (Eve Hewson) is eager to leave Los Angeles for New York to study fashion. While Eva and Albert go through the requisite awkward moments of new love, they also have to navigate the fact that they have baggage, for better or worse. What makes everything complicated (I won't give anything away) is Marianne, who is really down on her ex. All of her nitpicking and negativity eventually rubs off on Eva, who then second-guesses her relationship with Albert. Julia Louis-Dreyfus is funny and relatable, as she plays both loving mom and awkward dater. You can see that she's interested in Albert—genuinely likes him—but has been through this whole love thing before and wants to make sure this one will stick. Gandolfini is endearing and, yes, a little schlubby as Albert—totally playing against his Tony Soprano type. He's warm, totally gaga over Eva, and willing to open himself up after a bitter divorce. At some point, though, there's a limit to what one make can take—even from the woman he loves. Enough Said is a great date night movie for parents, if only because we can relate to how long-lasting relationships work—and don't work. How we can sometimes go down the nitpicky road (Collette and Falcone are hilarious in some of these moments) and how we love our kids so much that it's hard to imagine them going anywhere without us—even to college. But most of all, it's about mature love—about how we mess up, recognize our own petty faults, and then try to pick up the pieces. Hopefully with a little laughter thrown in. Brandi Chastain: The Ultimate Soccer Mom! 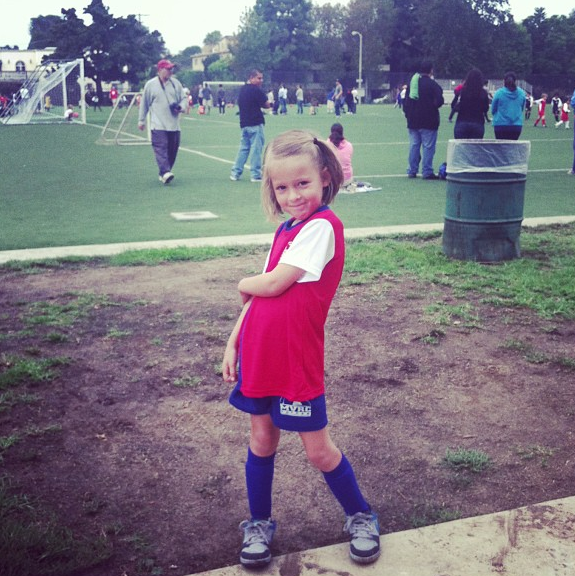 Brandi Chastain encourages families to be active together. 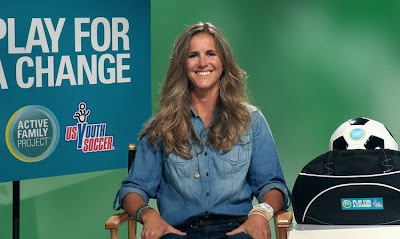 I chatted with soccer superstar and mom Brandi Chastain about her partnership with Merck's Play for a Change campaign, which encourages families to go out and play to be healthy. She also talked to me about bullying in sports, her 7-year-old son's first soccer game ever and that famous sports bra-bearing moment back in 1999. You can read it here on mom.me. UPDATE: Congrats to Dennybean! You've won the Family 4-Pack of Thomas & Friends tickets for the screening at the Grove on Sunday! Please email me at losangelesstory@gmail.com with your info. Thanks again! Thomas & Friends are coming to The Grove on Sunday, and it looks like it'll be a super-fun party! To celebrate Thomas & Friends' new movie, King of the Railway, which is arriving on DVD Sept. 17, there will be tons of fun activities and a screening of the movie on Sunday, Sept. 15 at the Grove! In addition to the movie screening, there will be a special story time with Sir Topham Hatt and a sing-along with Thomas the Tank Engine. 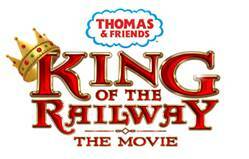 Thomas & Friends: King of the Railway – The Movie introduces new friends and new adventures and will debut from Lionsgate Home Entertainment on Blu-Ray combo pack, DVD, Digital Download and Video on September 17th. Hear Sir Topham Hatt, Controller of the Railway on the Island of Sodor, share the “King of the Railway” story with all of his friends in Los Angeles. Tickets for a special same-day advanced screening of “King of the Railway” will be distributed to the story time attendees on a first come, first served basis (subject to availability). There will be fun giveaways and a chance to take your photo with Sir Topham Hatt. Join Thomas the Tank Engine for a special sing-along live show featuring all of his favorite songs! Play with Thomas & Friends toys based on King of the Railway and get your photo taken with everyone’s favorite #1 blue engine. Get a free movie poster to take home! I'm giving away a Family 4-Pack of tickets to see "Thomas & Friends: King of the Railway—The Movie" at The Grove on Sunday, Sept. 15 at 4 p.m.
To enter, leave a comment below, telling me what your child loves about Thomas & Friends. For more chances to win, follow me on Twitter and retweet this giveaway. (You can retweet more than once for more entries.) I'm at @la_story. Or you can "Like" the L.A. Story Facebook page and share the giveaway. This is a quick one! I'll announce the winner tomorrow, Sept. 13 at 12 noon PT. Good luck! Let me start off by saying, "Finally!" We've lived in Los Angeles for 11+ years, had at least one child for almost 7 of those years, and last weekend we finally headed to that desert oasis Palm Springs. I didn't really know what to expect. I'd heard mostly that it's "hot" and a place to "shut. it. down," and I wondered if I'd just be begging to stay inside where it was air-conditioned. 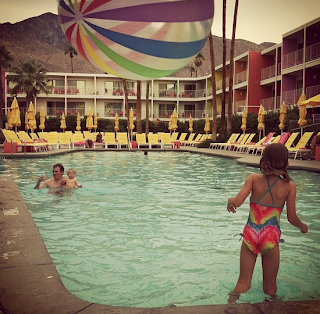 Turns out we found a fun, retro hotel called The Saguaro. (Thanks for the tip, A Cup of Jo!) It was super colorful and sat what felt like at the bottom of a huge deserty mountain. We had a ground floor patio room, which featured a natural "wall" of greenery that led directly out to the pool and bocce court. Baby Will even tried to make a break for it! 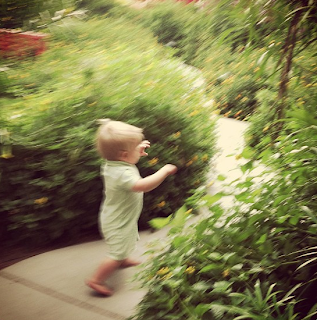 Baby Will, trying to ditch his parents and go to the pool. While it was hot -- 100+ degrees F, but a dry heat, as they say -- it was also overcast the first day, which made it perfect for the pool. On Saturday, the sun beat down quite a bit, which made the pool even nicer. "He wanted me to be his girlfriend," CC said with a flattered smirk. Anyway (changing the subject), it was such a short trip but not very far -- only 2 1/2 hours, which is nice. We'll definitely have to go back to catch a glimpse of Forever Marilyn and the dinosaurs. How did this happen? 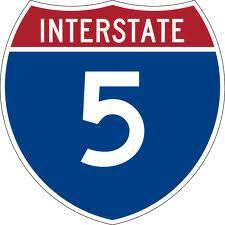 How did 5 years go by—not exactly quickly, but so eventfully? It's so hard to believe that I started L.A. Story with this post, when CC was just 1 year old. 1. The Goats—Oh, the Goats! Thanks to everyone who has visited my blog! Enjoy! 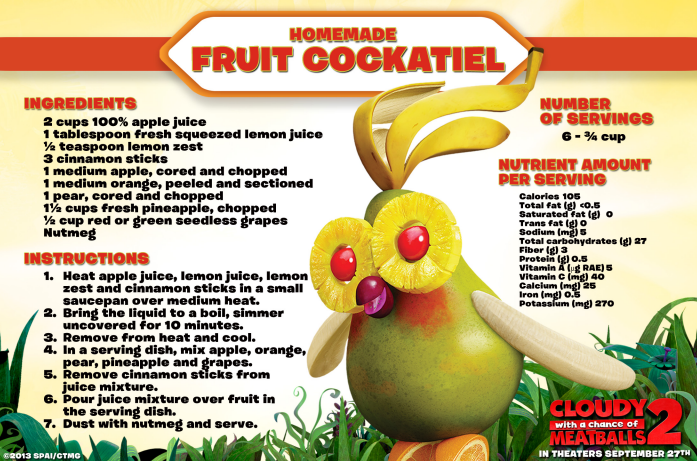 Cloudy with a Chance of Meatballs 2 will be hitting theaters Sept. 27, and CC is super-excited about this second helping of animated food madness. She loved the first movie (which I still need to see! 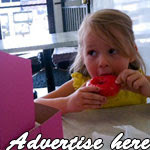 ), and she's been pointing out billboards and posters that spotlight the new "Foodimals." That is, food-animal hybrids like the Fruit Cockatiel pictured above. And, oh, that's just the beginning. There are also Cheesespiders, Watermelaphants, Shrimpanzees, Tacodiles and more! 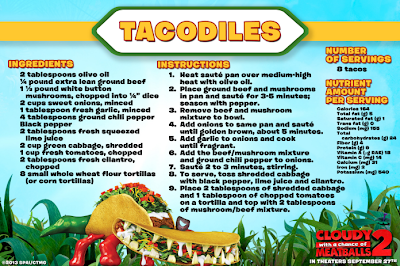 What's especially fun is that you can make tasty dishes like these at home. (CC will be thrilled!) 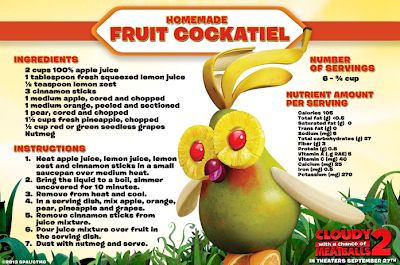 In fact, the film (from Sony Pictures Animation), has teamed up with Partnership for a Healthy America to create healthy, fun recipes inspired by these crazy creatures. 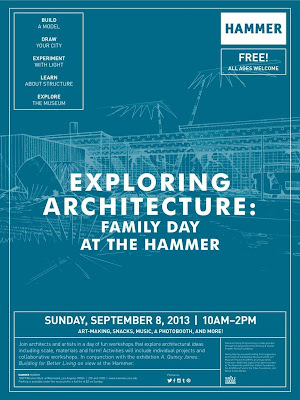 For your little Frank Gehrys or Maya Lins in the making, the Hammer Museum is hosting a free Family Day, centered on Exploring Architecture, on Sunday, Sept. 8. Tied to its current retrospective on L.A.-based architect A. Quincy Jones, this family-focused event will have fun activities for the kiddos, including art-making, building and drawing, and there will even be snacks from Whole Foods Westwood and a photo booth! Would love to see what CC would build -- maybe a My Little Pony ultimate stable or an L.A. pied-a-terre for Hello Kitty? We'll have to check it out! 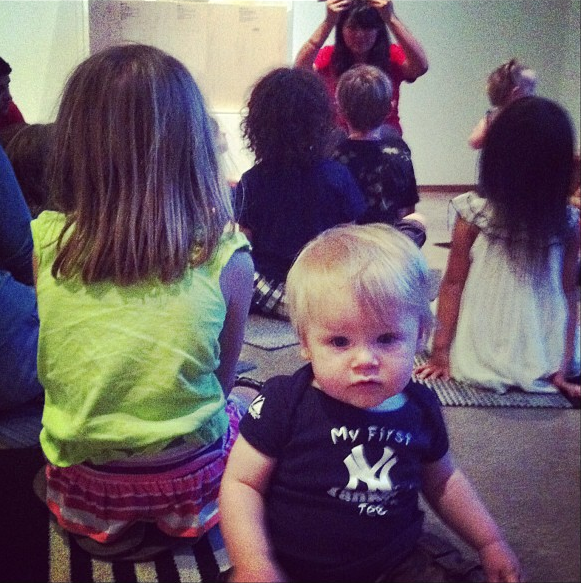 Doesn't Baby Will look like he's doing "The Magnum" here at LACMA's story time? 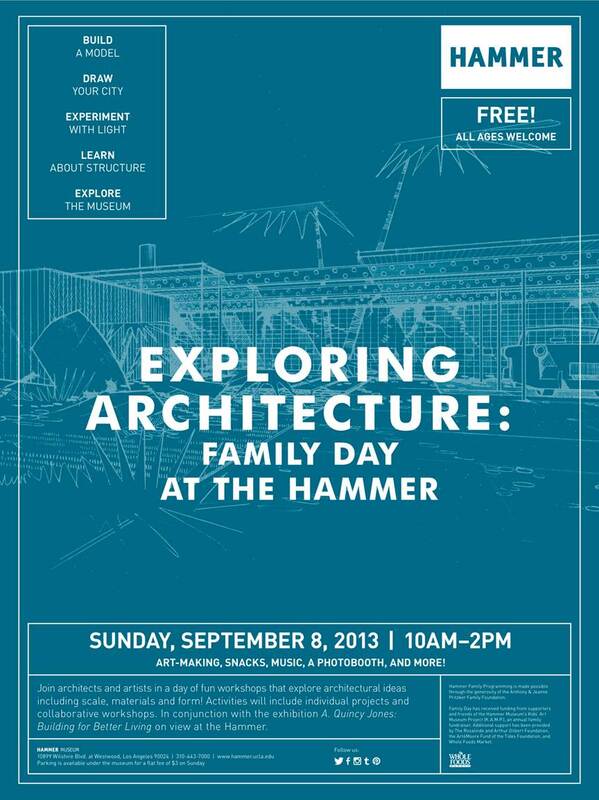 The kiddos and I spent part of Labor Day enjoying story time at the Los Angeles County Museum of Art. It was adorable. In fact, sometimes I forget just how kid-friendly LACMA can be. 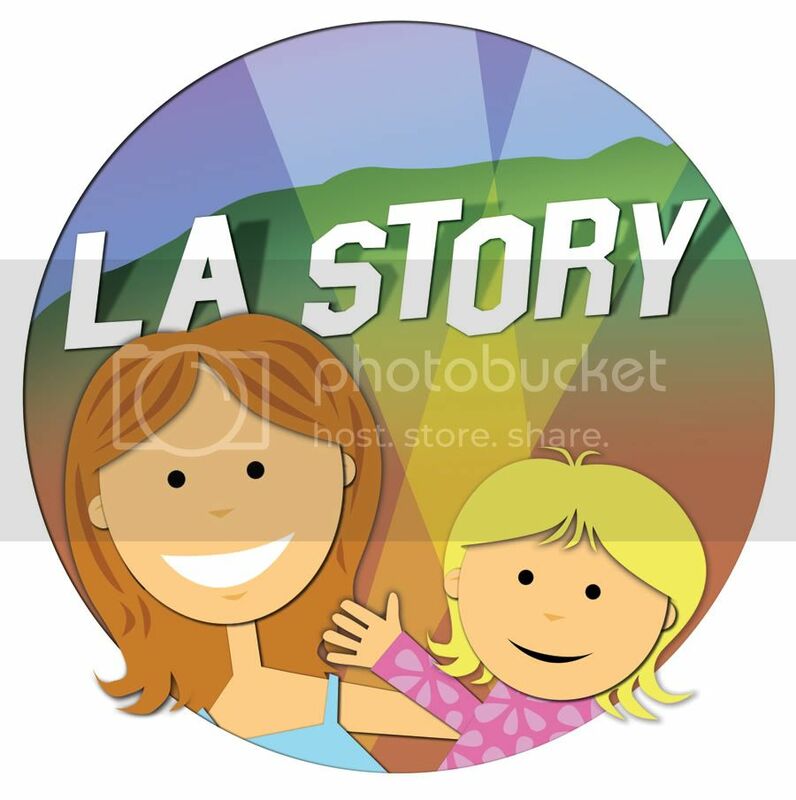 LACMA offers story time every Monday and Friday at 2 p.m. Bonus: It's free, no reservations required. So book it on over -- and squeeze in some free painting time while you're at it! 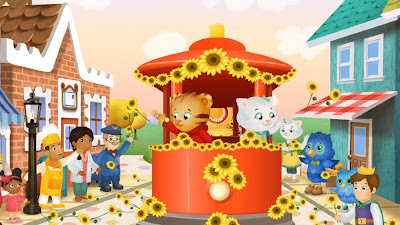 Mondays and Fridays at 2 p.m.
Labor Day is sure to be a beautiful day in Daniel Tiger's Neighborhood, as the little tiger with the red sweater celebrates his season premiere by being especially nice to those around him. The animated show from The Fred Rogers Company has its second season premiere on PBS Kids on Monday, Sept. 2 (check local listings), and what better way to enjoy the holiday than teaching your kiddos how to be helpful to neighbors? 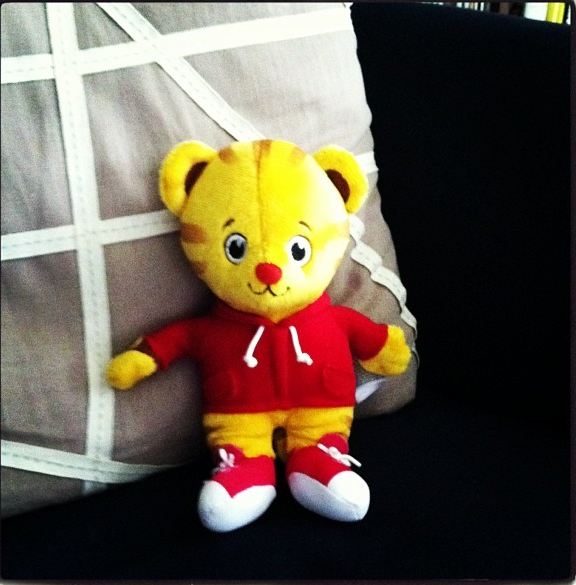 CC adores Daniel Tiger and thinks he's the cutest. It was even better then, when she found out that the Daniel Tiger line of plush toys has made its way to Toys 'R' Us. We received a sneak peek of the little guy before he arrived in stores, and I have to say that he's pretty adorable. I think Baby Will will also go a little tiger crazy for him.